Hold on tight, because an NSF-funded contact lens and eyewear combo is about to plunge us all into the Metaverse. Augmented reality (AR) has been steadily making inroads into society. Sure the gaming is fun, but when you consider fields like medical training and remote site access for safety inspectors and science teachers, AR offers a lot of promise. However, many head mounted displays (HMD) are clunky and cumbersome and continue to restrict wide scale adoption of AR. What's more, continual access to the digital world while navigating the real world presents a safety challenge. Close encounter. A smart investment by the NSF, eMacula puts augmented reality in a contact lens. So what's the remedy that will vault us in to the Metaverse? “Contact lenses appear to be an optimal solution, but only if the user experience can deliver on the promise in comfort, real functionality, and a price point that consumers can afford,” says Chris Collins, founder and technical lead for the Center for Simulations and Virtual Environments Research (UCSIM) at the University of Cincinnati. Finally, scientists have come up with a way to free users from HMD and bring the virtual world closer than ever before. To better integrate the two worlds, Seattle-based startup Innovega has developed eMacula. “Allowing a user to have their digital media within their normal and unobstructed field of view means that people will stop staring at their phones and devices and start looking at each other again,” says Jay Marsh, vice president of engineering at Innovega. 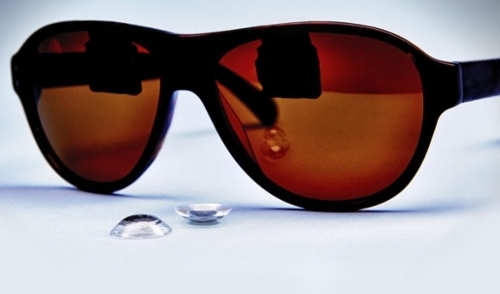 Funded in part by Small Business Innovation Research grants from the US National Science Foundation, Innovega has developed a filtered lens in a hybrid style contact lens along with lightweight and stylish eyewear. Pairing the glasses with a contact lens significantly reduces the burdens previously associated with HMD. “NSF was a critical player in the development of our current soft lens technology,” says Marsh. 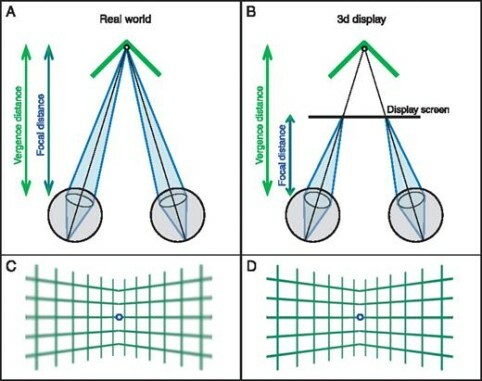 With traditional AR, a problem known as vergence-accommodation conflict arises since our eyes try to focus on the screen in front of them, but end up converging at a farther distance. Often eyestrain, headaches, and nausea result. The contact lenses circumvent this problem because the media on the lenses is in focus while the eyes converge on the glasses behind. Merging the real and virtual worlds has broad implications for many professions, Marsh says. Doctors and technicians that need both hands to execute their work while also needing access to critical information will find great use in merging the virtual and real worlds. In an industry setting, Marsh foresees applications that allow for system level safety data to be provided to all operators in real time, and more refined information based on physical locations. The lenses are currently undergoing FDA approval and should be on the market later in 2017. It appears the next step in the digital mobile evolution of technology may be on the horizon, and the natural integration of the virtual world into our real experience is at hand.